The PPE Race Fuel Valve (heat treated SS construction) replaces stock or a shimmed pressure relief valve. This valve helps maintain fuel rail pressure during full throttle driving by completely blocking the pressure relief port (effectively deadheading the fuel rail). 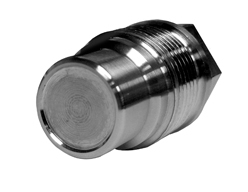 It eliminates low fuel rail pressure DTC codes P1093 or P0087 (low fuel rail pressure during power enrichment) that are caused by insufficient PRV spring pressure. Solid steel construction.